BROOKLYN, New York City (WABC) -- A family in Brooklyn is on a mission to save their children, who are suffering from a rare genetic disorder. They're trying to raise money for a treatment they say could also help others suffering from diseases like Alzheimer's or ALS. For the first six month's of his life, Benny Landsman was a healthy baby boy, but then, there was a noticeable change. 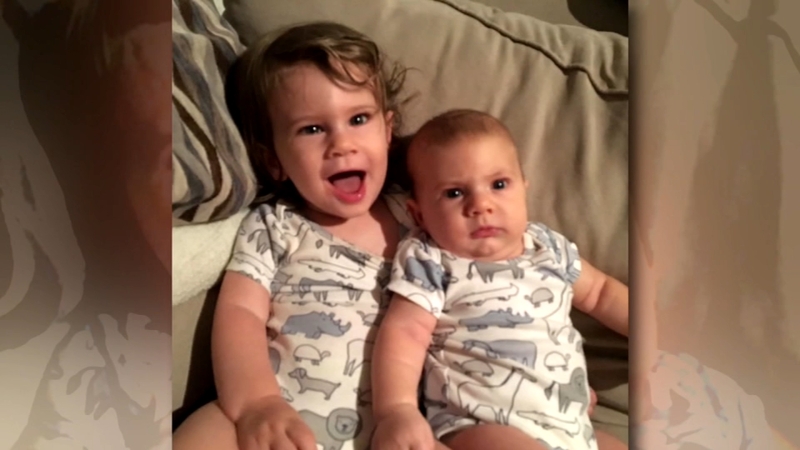 "Around six months, he wasn't holding his head up," mom Jennie Landsman said. "And he wasn't sitting by himself, which he should have started to do independently at that point." She and husband Gary Landsman began seeing countless specialists over the next seven months, desperate for a diagnosis. Finally, they learned he had the rare Canavan disease. "Canavan's disease is a rare genetic disease that effects the ability of the brain to send and receive messages," said Dr. Joanne Stone, director of maternal fetal medicine at Mount Sinai Health Center. By the time the Landsmans learned what was afflicting their son, they had a new addition in the form of 2-week-old baby Josh, who also tested positive for the rare degenerative disease. "We're taking life day by day right now, because when you think about the big picture, I don't want to go on," he said. "I don't. But taking things day by day, they're beautiful babies, they're happy babies. Josh at about four months now is starting to smile and starting to become happier, and they are fun." Symptoms of Canavan disease begin developing in children between three and six months old, affecting their ability to sit, stand, walk or talk. Most don't live beyond the age of 10. "The geneticist said they're missing an enzyme," Jennie said. "And I said, 'Okay, when can we start giving it to them?' Like, it seemed so simple, and she said, 'No, it's fatal.' And I just, like, that was it. It was like the world ended." The Landsmans are now in a race against time to find a cure for the disease, taking matters into their own hands after finding a promising gene therapy in need of funding. They started a GoFundMe page aimed at raising the $1.2 million needed for research of the treatment. "Accepting this fate was not something that we were comfortable doing," Gary said. The parents hope the money they raise will get the treatment out of the lab and to patients in need. "And the treatments that can help Canavan's disease, they could help other neurodegenerative diseases like Parkinsons, ALS and Alzheimer's," Jennie said. "So it really can help so many people." The family is dreaming of life with a cure. "I hope one day we'll be able to put our boys on a school bus and send them off to school and not be able to wait until the end of the day when they come home so we can hear about their day," Gary said.